Crowds were sparse and Mardi Gras costumes even sparser on Tuesday for what amounts to a day-long parade of parades — 11 of them, one after the other. "I never saw this few people before," Roshawn Gilmore, 27, said as the Zulu parade began about five blocks away from the spot he and his family had staked out before dawn on St. Charles Avenue. CBS' Manuel Gallegus reports that New Orleans police haven't had much trouble with rowdy revelers this year, though pushing through the Bourbon street crowds and watching out for flying beads from overhead are once-a-year strategies. Long rows of empty chairs marked off some spaces on the normally jammed parade route, where families usually send at least one person early to stake out their spaces for Fat Tuesday. Much of the prized Garden District curb was wide open as the Zulu Social Aid & Pleasure Club began its parade a few blocks away. Fat Tuesday this year is the earliest it's been in 15 years — so far from spring break that it kept much of the college crowd away. Still, people continued to pack onto Bourbon Street Tuesday midday, despite very little standing room, reports Dave Cohen of CBS radio affiliate WWL-AM, many of them removing more and more clothing or putting on more and more elaborate costumes as they get closer to the end of Mardi Gras." There were people from all over the world and all over the country, including Kermit Hubbard from Fort Bragg, N.C.
"I'm having a hellacious time," he told Cohen. "Plenty of good time, plenty of good people, plenty of good music, beautiful, wonderful food. Ooooh, you ought to be here!" But when the ornate Rex parade carried the king anointed by an organization of leading society families down St. Charles Ave., spectators were only a few deep, instead of covering the median. On Zulu's route the median and sidewalks were more crowded than they were near Gilmore's space. But, still, many of the chairs were empty as black riders in grass skirts and blackface — the parade started as a spoof of white parade "royalty" — tossed beads to all and sundry and handed painted coconuts to a favored few. Gilmore said his family has been staking out an early spot his whole life. They came about 5 a.m. Tuesday. "We normally get here a lot earlier. But just decided to come late this year, and it worked OK," he said. His mother was sleeping on a tarpaulin, wrapped in quilts. Other relatives sat and watched the thin crowd walking up and down. Edward Dunnaway, 46, of New Orleans, had been there since 11:30 p.m. Monday, and was grilling food in a full slice of the 50-foot-wide median marked off by rows of metal police barriers. "We don't have any trouble. They don't mind," he said. Inside the barriers were two dining canopies, plenty of ice chests and tables covered with chafing dishes, other food containers, and decorations in Mardi Gras colors of purple, green and gold. The median was muddy from rains that made costumed revelers pull out umbrellas and rain jackets Monday night. But Monday's parades rolled on, as did the drinking, eating and shouts of "Happy Mardi Gras!" "Rain? Who cares," said Tina Black, 30, of Los Angeles. "As long as it doesn't get cold. I have a really skimpy costume and I hate cold." "This is it, baby," said Paul Perrin, 22, of Dallas, part of a group in lawn chairs and debris along the St. Charles parade route. "You're either ready or you stay home. It's no place for the weak." Fireworks, musician Harry Connick Jr.'s lavish Orpheus parade and concerts by the Mississippi River were among the attractions Monday night. 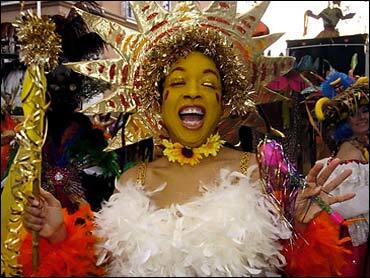 Fat Tuesday has 11 parades, beginning with Zulu and continuing until dark. Merchants and bartenders said business was brisk in the French Quarter, though down from previous years. They blamed the weather and the calendar: the annual pre-Lenten bash falls early this year. "It's definitely off," said Fallon Daunhauer, a bartender at Johnny White's in the French Quarter for 21 years. "I think both things hurt. It's not the best weather and it's so early. Too close to Christmas, not close enough to spring break to get the college kids in." Still, workers rushed to stock up and clean up for the final time before Wednesday. Piles of trash bags were hauled out of bars; cases of drinks were hauled in. "We've got to get it done and get out of here before noon," said Phillip Ocburn of Crescent Crown Distributors. "After that forget it." A half-block row of portable toilets lined the front and back of the stately Louisiana Supreme Court building, high fences blocked off the entrances, beads, beer cans and trash littered the grounds. Beverly and Chester Lott munched beignets Monday morning. The Mississippi couple had already seen five parades and what they called some fantastic street theater. "We love it. It's the best time you can have anywhere," said Beverly Lott, who wore a huge orange wig. "We came for the first time last year, and plan to be back every year." A daylong party was held on the banks of the Mississippi River with music and the landing of the faux royalty for the Zulu and Rex parades, the two biggest to roll Tuesday. There were no reports of violence, one day after a man was shot along a parade route near the French Quarter.